Don't get caught off guard when RVP switchovers start impacting gasoline prices along the fuel chain. The yearly springtime shift to mandated low-RVP levels in gasoline has already kicked off in U.S. spot markets. Starting April 1, low-RVP designations will start to appear at the rack. 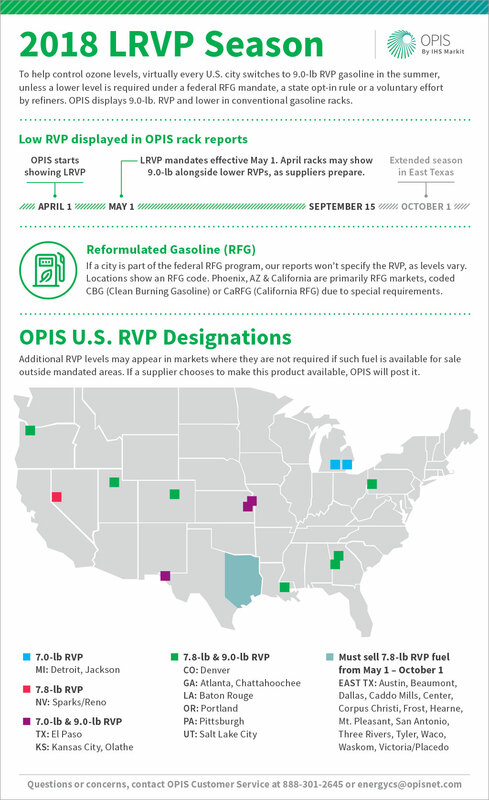 Download this handy OPIS infographic to help you understand the annual switch to Low RVP fuel. Low RVP appears in OPIS reports as of April 1 -- how will prices be impacted as suppliers prepare for the May 1 mandates? Use OPIS Rack Prices to monitor wholesale price fluctuations in your local market. Start your free trial now.